I don’t know about you, but I can’t go anywhere in September without finding fun apple stuff, from apple desserts to apple games, and even fun apple science projects. That’s right, we’re going to take those apples, have some fun, and do a little apple science. You’ll find fun chemistry experiments and a few physics experiments. Plus, you’ll even try a few kitchen science experiments. 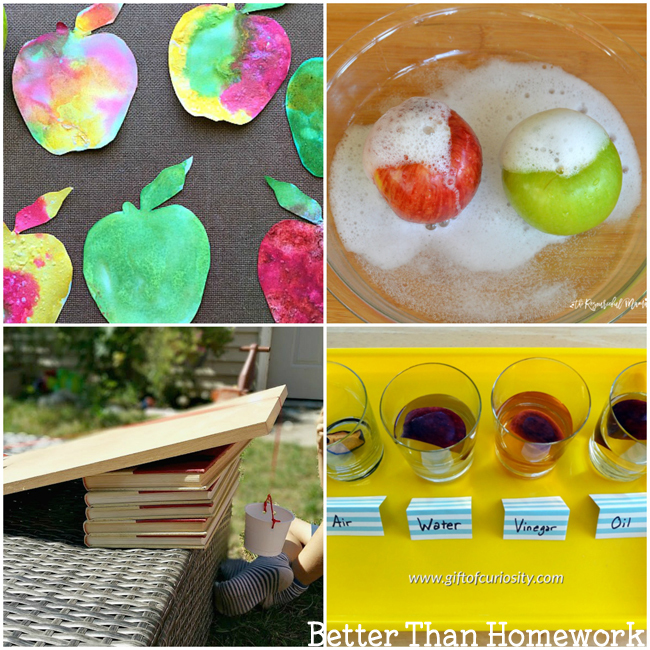 These fun projects are all great ways to have fun and learn at home. 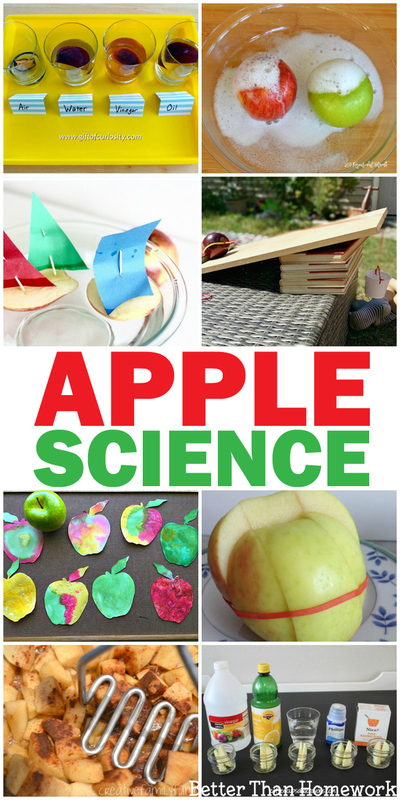 Combine science and art when you make this fun Fizzing Apple Art Project at Kids Play Box. 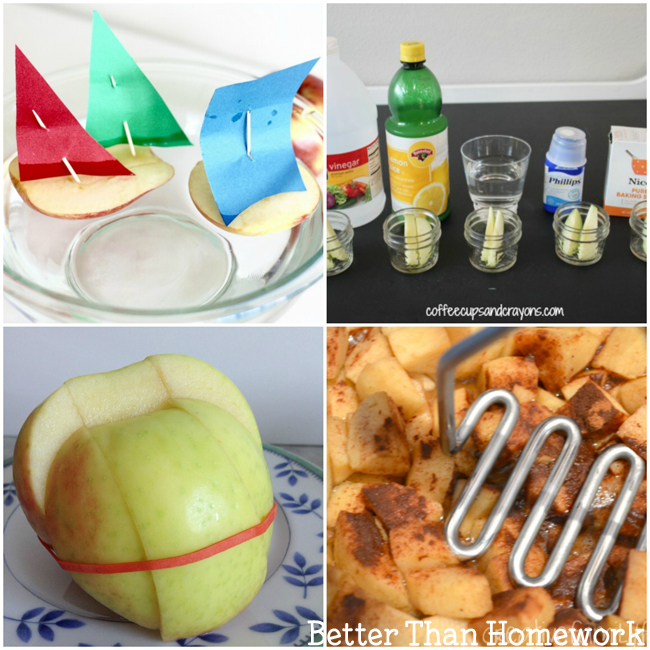 Do a twist on the classic baking soda and vinegar volcano when you experiment with Apple Volcanoes at The Resourceful Mama. Explore gravity when you try this Apple Races physics project from Little Bins for Little Hands. How many pennies does it take to get an apple up an inclined plane? Answer the question when you try this fun experiment at Kid Minds. Find out what happens to an apple under various conditions when you try this simple Apple Rotting Experiment from Gift of Curiosity. Can you make an apple lose weight? Explore weight with this fun Apple STEM Weight Loss Experiment from JDaniel4’s Mom. Can you turn an apple into a boat? Little Bins for Little Hands shows you in this fun STEM challenge. Use acids and bases from your kitchen to see how they effect apples with this simple science experiment from Coffee Cups and Crayons. Turn an apple into a shrunken head with this spooky science project from Teach Beside Me. Can you keep an apple from browning? Test your theories with this fun experiment from Kitchen Counter Chronicles. How does heat change an apple? Answer this question in the kitchen when you make up a batch of Slow Cooker Applesauce from Creative Family Fun. Don’t these all sound like fun? 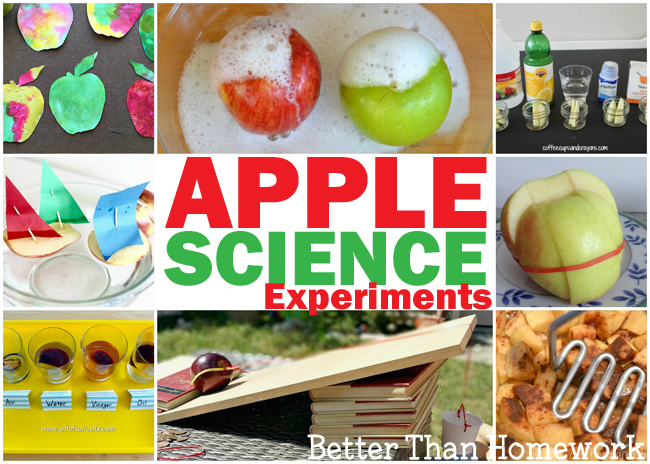 Grab some apples, put on your thinking cap, and try one (or all) of these fun apple science experiments.